It has been about one year since the announcement of ESP32 SoC and the beginning of its beta testing for some developers. Last Month we covered the release of ESP-WROOM-32 module datasheet, which promised that “New SDK features, tutorials and example applications will be released over the next few months.”. The ESP-32 datasheet was released at the end of August. So let us discover the details of ESP-32 SoC. ESP32 is a single 2.4 GHz Wi-Fi and Bluetooth combo chip available in QFN48 (6×6 mm) package. The new chip supports 802.11 b/g/n/e/i protocols with a data-rate up to 150Mbps. The previous ESP8266EX SoC supports 802.11 b/g/n only. 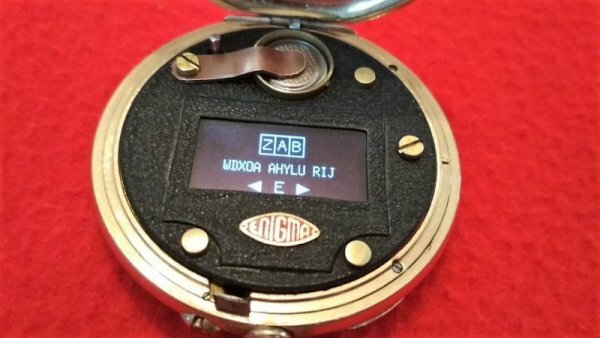 The security is enhanced in ESP32 by supporting WPA/WPA2/WPA2-Enterprise/Wi-Fi Protected Setup (WPS), while ESP8266EX supports only WPA and WPA2. 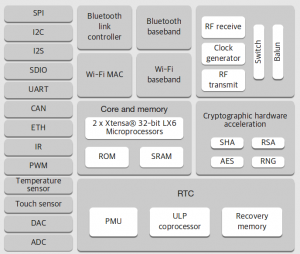 ESP32 features a BT4.2 controller and host stack with Xtensa Dual-Core 32-bit LX6 microprocessors up to 240 MHz. 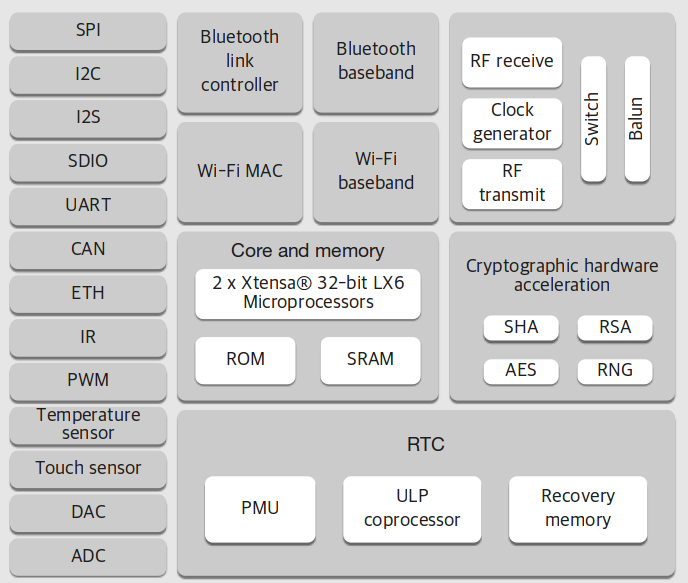 Keep in mind that ESP8266 has single core and lacks a bluetooth transceiver. A lot of peripherals were added and enhanced. Up to 18-channel ADC with 12-bit resolution, two DAC channels with 8-bit resolution, 4 × SPI, 2 × I2S, 3 × UART and 2 × I2C. ESP32 also features 1 host (SD/eMMC/SDIO), 1 slave (SDIO/SPI), Ethernet MAC interface with dedicated DMA and IEEE 1588 support, CAN 2.0, IR (TX/RX), Motor PWM and LED PWM with up to 16 channels. Hall, 10 × touch and temperature sensors are internally available in ESP32 SoC. Cryptographic acceleration hardware is for AES, HASH (SHA-2) library, RSA and ECC with Random Number Generator (RNG). 448 KBytes ROM for booting and core functions. 520 KBytes on-chip SRAM for data and instruction. 8 KBytes SRAM in RTC, which is called RTC FAST Memory and can be used for data storage and main CPU during RTC Boot from the deep-sleep mode. 1 Kbit of EFUSE, of which 256 bits are used for the system (MAC address and chip configuration) and the remaining 768 bits are reserved for customer applications.